Brian Hartline has been getting it done. Many wondered what Brian Hartline was thinking when left Ohio State after a 21-catch junior season. Hartline’s unexpected impact as a rookie kicks off today’s talking points. Hartline makes a play nearly every time he catches the ball. 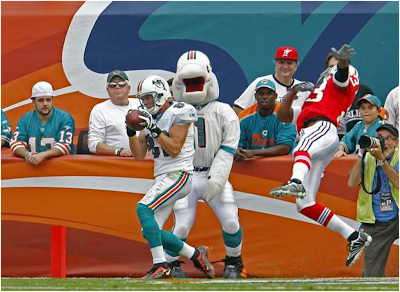 Hartline’s 21 receptions are fourth among Dolphins’ wideouts, and sixth overall. But 17 of those catches are for first downs, including a team-high three touchdowns, the most by a Dolphins’ rookie wide receiver since Chris Chambers had seven in 2001. Hartline leads the team in average per catch (14.8 yards), and also has chipped in four special teams tackles. When the Dolphins drafted Hartline in the fourth round last April, he appeared to be a copy of Greg Camarillo. Both run excellent routes, but Hartline has an extra gear Camarillo lacks, however he makes up for it with the best hands on the team. Vrabel’s leadership plays well in K.C.